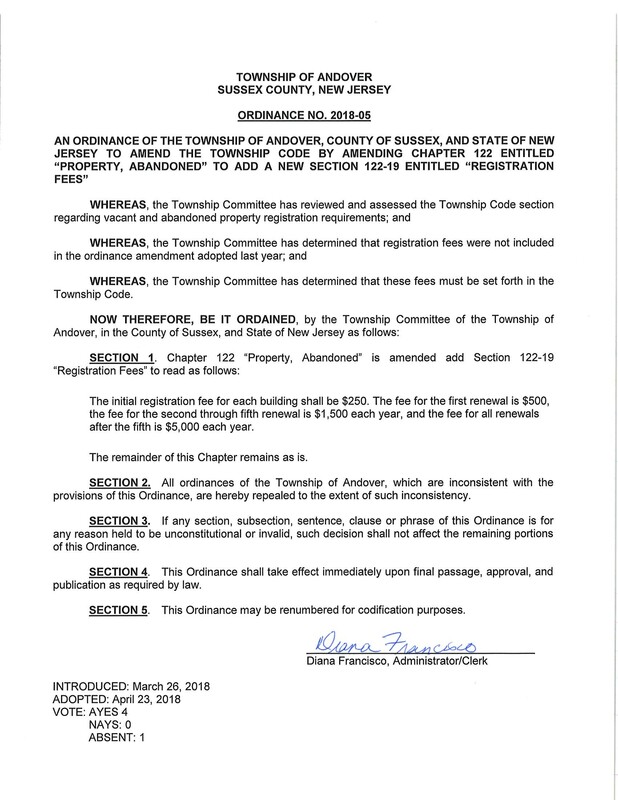 Andover, NJ: City Council has passed an amendment to its abandoned and vacant property registration ordinance, establishing an annual fee structure. Vacant and abandoned property registration will now include an initial fee of $250 for each building, with $500 fee for first renewal , then $1,500 yearly renewal fee for the second through fifth renewal of registration, and capping off at $5,000 per year for each year of registration past the fifth renewal. Registration is required for any building that has not been occupied for at least 6 months, and has at least one of the following criteria: declared a “nuisance” property by the City; found unfit for habitation; it is deemed a fire hazard; the property is unsecured or securing is inadequate to prevent unauthorized access; vermin, debris, or overgrowth has occurred or accumulated; or the property appearance is detrimental to the economic viability of the community and surrounding properties. Properties may avoid registration requirements if it is demonstrated to the City that rehabilitation of issues for the property are actively underway and a viable timeline is being adhered to, for said rehabilitations. Failure to proceed with rehabilitation or registration may results in legal actions by the City to alleviate the issues, up to and including the possibility of the City attempting to gain the title of the property to sell for proceeds to cover costs involved. The ordinance change is now in effect.